Collection of Sir Francis Winnington, 6th Bt., Stanford Court, Worcestershire. This painting is a mid-sixteenth century replica of Hans Holbein’s celebrated portrait of Henry VIII. It derives from Holbein’s 1537 Whitehall mural, in which Henry VIII was grouped together with his father Henry VII, his mother Elizabeth of York, and his third wife, Jane Seymour. The mural was destroyed by fire in the seventeenth century, but the image of Henry it presented had quickly become the standard image of the King by the late 1530s. A number of high quality replicas, some of which were almost certainly painted in Holbein’s studio, are known from the late 1530s onwards. In fact, so prevalent did Holbein’s face-on portrait of Henry become that a number of earlier likenesses of Henry, in which he was presented in the more conventional three-quarter profile, were later painted over with Holbein’s design. Holbein’s use of a face-on composition for Henry’s portrait marked an important break with convention. 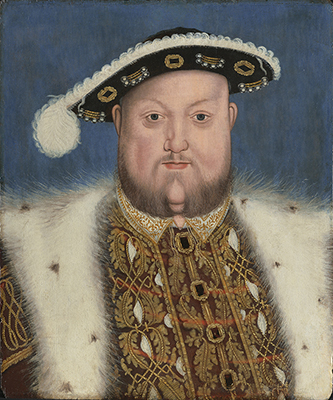 His first portrayal of the King in oil showed Henry looking to the side, as seen in the Thyssen portrait [Thyssen Collection, Madrid] of the mid-1530s, a picture which demonstrates the challenges Holbein faced when painting the king, for Henry by then had become a formidably unattractive man. He had always been well built — it was said in the 1520s that ‘when he moves the ground shakes beneath him’ — but in the latter half of his reign his girth grew greatly. Holbein’s full-length cartoon for the Whitehall mural [National Portrait Gallery, London] shows Henry looking to the side, as in the Thyssen picture; but at such a large scale we see just how unflattering the pose is, not least in showing Henry’s hooked nose and large double chin. Holbein somehow had to transform Henry’s irascible bulk into an identity fit for royal stately power. His answer was to use the frontal pose repeated in the present picture. The format was unconventional in sixteenth century portraiture, since it was considered to be impolite and ‘graceless’. But Holbein, as so often, clearly liked breaking convention. The frontal pose was used regularly throughout his career. It appears in a number of drawings, and in the portraits of Christina of Denmark Anne of Cleves, and, most notably, the portrait of Charles de Solier [Dresden Gemaldegalerie], in which the pose is almost identical to that used in the final version of the Whitehall mural. Solier’s portrait was painted during his spell as French ambassador to London in 1534. It is possible that Henry VIII saw Solier’s portrait and approved. Thus Holbein’s portrayal of Henry evolved as Henry grew ever larger, and all subsequent portraits of the King show him in this manner. Holbein’s ingenious trick was to accentuate Henry’s bulk, rather than reduce it. By placing his hands on his hips to make the stance more confrontational, and by incorporating the head and neck square-on, Holbein created a human fortress of imperial strength. The present version was painted by an unknown, near contemporary follower of Holbein, and is in unusually good condition; the blue background, made with smalt, is largely unfaded, and retains much of its original vibrancy, while the flesh tones and detailing on the face are all well preserved. The initial design of the face has been taken from a template, or ‘mask’, the source of which would ultimately have been taken from Holbein’s portrait. Infra-red reflectography has revealed fine under-drawing and ‘pouncing’ marks in the face, where the paper template would have been placed on top of the panel and effectively traced by means of small holes through which a powder, most likely charcoal or graphite, would have been applied. Holbein himself used the same technique when making the Whitehall mural – close inspection of the surviving drawing for the mural (National Portrait Gallery, London) reveals a series of similar holes all along the outlines of the figures. Dendrochronological analysis of the oak panels on which the portrait is painted has shown that the earliest felling date for the tree used is 1546.